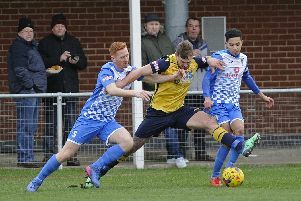 Moneyfield’s title ambitions suffered another blow with a 1-0 defeat at Paulton Rovers in the Southern League division one south. A 75th minute goal condemned Dave Carter’s side to a second successive defeat. The Dover Road outfit slipped to third place four points behind leaders Blackfield & Langley. In the first half Sam Pearce squandered the visitors best chance of the game. A far post cross was headed back across goal but Peace fired over the top when it seemed easier to score. After falling behind Moneyfields applied late pressure but couldn't find an equaliser. Boss Dave Carter said: ‘We fired blanks all day..
‘It is frustrating because up until our last two games we had scored in every one. ‘It didn't help that we were without our two main strikers. ‘Steve Hutchings was suspended and Dan Wooden pulled out during the morning. ‘That meant we had to go with a makeshift strike force. ‘Our centre half Sam Pearce played up front and he was gutted when he missed his chance. ‘If we had scored first then we would have won the game. Bognor moved up to third in the Bostik League premier division with a 2-0 win against AFC Hornchurch at Nyewood Lane. 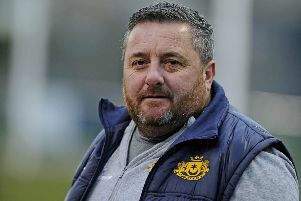 It was a second win in three days for the Rocks who are picking up momentum in their promotion push. Returning loanee Theo Widdrington set the home side on their way from the penalty spot four minutes before half-time. Widdrington won the penalty and then sent the goalkeeper the wrong way from the spot. The Rocks tightened their grip on the game five minutes after the break. Harvey Whyte surged forward and Richard Gilot crashed the loose ball into the bottom left-hand corner of the net from outside the area. The Wessex League programme was decimated by the weather. Fareham Town, AFC Portchester, Baffins Milton Rovers and Horndean all had their games postponed because of waterlogged pitches. In the Hampshire Premier League senior division Paulsgrove strengthened their position at the top with a 3-1 home win against Stockbridge. Jimmy Hird, Danny Lane and Bobby White were the home marksmen. In division one AFC Petersfield suffered a 6-2 defeat at Netley Central Sports.